It’s clear that they are right, sort of: by and large, consumers won’t pay for content for the sites they visit as long as there is a good-enough free alternative. But that isn’t what this is about. In all likelihood, the brainy folks at News Corp agree too; and their point is not to fight to convince the consumer with their bold statements in the press, but to change the industry. In fact, from all the clamor they are making, it’s been clear that the goal of their campaign isn’t even all that much about making their own strategic shift to paywalls. Instead, it looks like News Corp’s goal is to get the entire industry to do so. And they’re right to do so: let’s face it, if everyone went pay, consumers who value content significantly wouldn’t have a choice but to change their behavior. Force the conversation. 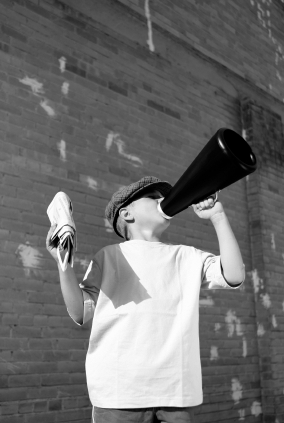 Make as loud a noise as you can about going pay, and importantly, get as much press coverage as you can. Make sure that paywalls are the topic of every executive team and board level conversation in major publishers. Highlight that there must be a better way – that the industry needs a better structure than the current one. The goal is to get enough of the top players in the industry on board to tilt the balance to where consumers need to pay up for paywalls. For most of the readers of this post, if you couldn’t get the bulk of the sources you read for free, would you even think twice before subscribing (as long as the rates were reasonable)? If the New York Times, CNN, TechCrunch, PaidContent, and my local paper were all behind paywalls, there is no question that I would subscribe to one (or more likely a bundle with more than one) of them. 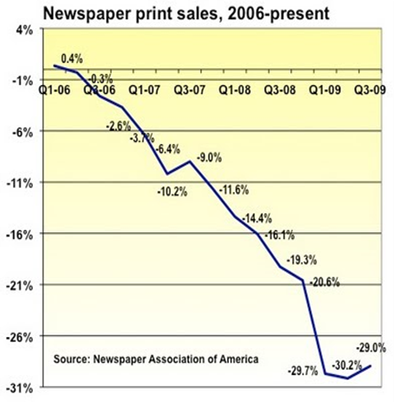 With the right consumer offering with good value for money, and the elimination of high-quality free alternatives, it doesn’t even take much creativity to find proof points: that’s exactly the model that built the daily newspaper industry to its $50B ad expenditure peak in 2006 (NAA). If Rupert and his team at News Corp can bang the drum loudly enough to get enough others on board, he has the chance to make subscription the new free. I had dinner recently with a friend at a big traditional magazine publishing house. We talked about the predicament of the majors: circulations in decline; ad rates falling; a reduction in the number of pages per issue. The traditional publishing model is hanging by a thread. And as we’ve all seen, blue-chip magazines are closing their doors as they can’t make ends meet in the new world of media. My friend works in the online division, and has lots of exposure to senior company executives. And one thing he told me surprised me: When he talks with his higher-ups, they just plain don’t acknowledge that online is the future of their business. They’re too preoccupied trying to figure out how to save their bread and butter versus figuring out how it will morph to completely different model – an online one. Now don’t get me wrong. I’m not saying that online is going to save the traditional magazine. It’s not. The economics of online publishing are arguably even worse than traditional publishing. But that doesn’t change the fact that consumption of content is moving rapidly and unstoppably from offline to the web and mobile web; and that means that the offline publishing business is in inevitable decline. The options for an old-school publisher are simple: they can harvest their declining businesses; or begin the hard journey of building a new business to replace them. But what is very clear is that the two cannot be done at the same time. Inevitably, the companies that will succeed in the new digital economy are the ones that are willing to make sacrifices to their existing businesses. My favorite example of a company that is committed to this sacrifice comes from the world of semiconductors. For years, Intel demonstrated the philosophy of obsolescing their own products by creating new ones – before their competitors did. Each generation of microprocessor they produced put the prior one – just a year or two old – out of business. This is a survival skill in a fast-changing industry like semiconductors. But decades-old publishers, steeped in their own business heritage, act as though they their world is not changing; when in fact it is changing as fast as microprocessors themselves. Is it that they don’t know, or that they don’t care? Time Warner has set one of the best examples of a media company willing to break with old habits in order to find a path to a better place: Not only have they initiated an industry joint venture, but they did it the right way. Now, they’re showing some early fruits of those decisions to bust loose, in this demo video of the prototype they developed with Wonderfactory, the agency hired for product concepting and development of the tablet. Let’s look at some of the things that Time Warner has done right. These can be something of a cheat sheet for other companies who are willing to take big risks. They didn’t wait. They saw how successful Kindle is based on all the buzz, and realized that it demonstrates an opportunity area. They freed it from constraints. They broke off into a separate organization with a separate charter, to break free of existing course-of-business requirements. They went off the reservation. To get truly “no constraints” thinking, they turned to an outside agency. Smart move, since startup-within-a-BigCo projects can be hampered by all kinds of unstated — and false — assumptions from old “lessons learned” that no longer apply; and from an implicit imperative that new efforts should align with the old. They are creating a new experience for consumers. More and more, content, like it or not, is a commodity. But experiences are unique and irreplicable. That makes them rise above, and gives consumers a reason to be excited, to buy, to use, and to come back again and again. Whether or not the device is successful itself, this will give Time Warner an organizational advantage: they are demonstrating not accepting the false constraints of maintaining old paradigms or riding the curve down. That DNA impact is enormous, as it creates the license for others at that company to take risks. Ultimately, the publishing industry is facing the problem that their “content” is relatively undifferentiated. Time Warner has shown that they’re willing to take the risks to create a new experience that is worth noticing for consumers. And Time Warner is further separating itself from the other media companies who are too frozen to do what it takes to try creating breakthrough consumer experiences. Those companies will ultimately suffer, since the best path to a thriving audience — and new revenue streams — is by winning consumers over. The media industry is in crisis. We see the headlines every day that hard times are falling on the media industry: earnings falling, magazines closing, ad revenues down, and layoffs galore. The biggest names in media are losing share rapidly while the rug gets pulled out from under them with collapsing prices. New opportunities are being created every day for those who get in front of the new model. And while the daily news is well reported by PaidContent and others, what we all really need is a beacon to see the bigger picture, call the most important themes, and light the way. For the media companies that have been around for a while, the question is how quickly their business is going to erode. For the rest of us, it’s how many billions more can we make at their expense. Because the media industry is in the midst of a painful journey to find a better way — but all too often, all we noticed is the foibles we step into along the way. Too many sources out there are calling out the cuts made by the machete from inside the jungle. This blog is a chance to light our journey through the jungle, to get a look at the path from above. We’ll look at where the path needs to go, and to view the turns that companies are making along the way: where they are falling off that path to profit — and where new companies are changing the shape of the path as we go. Lord knows we can all use some help finding our way from the bleak landscape of media today to constructing a new, profitable media world. And Just What Is The Path To The Money? We are coming from an old model of publishing — a 1.0 model — that took literally centuries to develop. Over time, it developed the a system of journalism based on staff writers and editors, freelancers, high fixed costs for printing presses, sizeable marketing budgets. It was supported by one major point of leverage: the scarcity of ways for advertisers to reach an audience. That scarcity translated into premium revenues; and it was those premium revenues that funded the growth of massive TV networks, publishing empires, and even cable networks. But that scarcity no longer applies. With the digital content explosion, attention has spread everywhere. The choke points of access have widened and dissolved, and access to audience is plentifully — and cheaply — available. What we need is a new model for publishing, “Publishing 2.0”, with costs that are in line with ‘new normal’ revenue levels. Companies like wikiHow and Yelp are leaning on users to lower their costs; while sites like Hulu and Wonderwall are creating premium experiences to drive premium revenues; and the Wall Street Journal — with some of the highest premium ad rates around — has created a content collection to valuable that exclusivity is reason enough for it to earn a strong subscription business. And companies like Gawker and Demand Media have gone to new lengths to rethink their workforces, tapping low-priced freelancer markets in the U.S. and abroad for varying degrees of quality. None of these examples has established itself as the single winner of the Publishing 2.0 battle. But media has never been a winner-take-all market. And if internet media has taught us one thing, it’s that consumers are looking for huge variety in the content and experiences they consume. But to win a large share of that consumer interest, and to monetize it at a high margin, digital media companies will have to master these changes. The ones that do so the best will be the new “2.0” media empires.